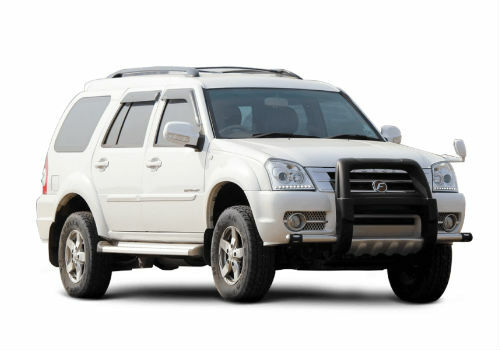 Force Motors Force One comes in 4 variants with 2 engine and 1 transmission and 1 fuel options. The car has a mileage of 11.6 Kmpl Diesel Manual with colours like Intense White, Bold Black, Fierce Red, Emphatic Grey, Robust Blue, Moondust Silver. The Force One is available with only one variant at the moment. It is the first Indian car to get day-time running LEDs with a 2.2-litre engine. The first thing that you may notice on the Force One is its size. The bonnet is stout and short liberating space inside the cabin along with large 16inch alloy wheels. At the rear, the tail gate is top hinged with faux tail light clusters. Inside the car, two adults can sit comfortably even in the third row with a decent boot space leaving good legroom and headroom for all. The large dashboard is made by faux wood. The quality of plastics used overall could be much better. The centre console owns controls for the AC and Bluetooth compatible music system. The Steering wheel has controls for stereo, Bluetooth telephony and cruise control. The twin pod instrument panel offers a warning light for every single system in the vehicle. The seats are though flatter with little support and less of good fit and finish. The car has panel gaps with poor leather stitching. Quality of plastics too are not up to the mark. The SUV is quick to accelerate and easy to drive. Though the clutch action is light but shifts on the 5-speed manual are hard and need effort. On the move, the Force One shows signs of being a good handler. Body roll is better controlled, inspiring confidence to push around the bends smoothly. The steering wheel gives back little feedback but the ride quality does not suffer as the suspension absorbs bumps well. The car is the coolest and the most charismatic Volvo you may ride. The car has a 4-cylinder performance motor that is certainly racier than all the other Volvos on sale today. The car weighs 24 kilos lighter over the front axle and 20 kilos lighter in total compared to its predecessor.